Subject of Research. 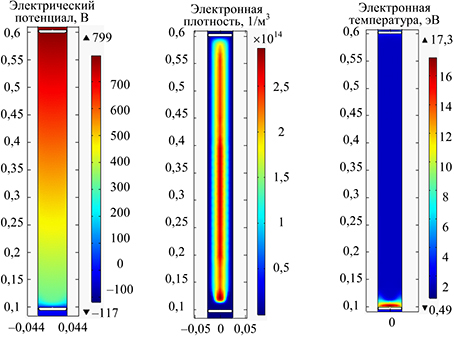 We present research results for numerical modeling possibility of discharges in gas mixtures within the modern model of nonlocal plasma by creation a sequence of plasma-chemical and numerical models and comparing the results with experimental data. Method. 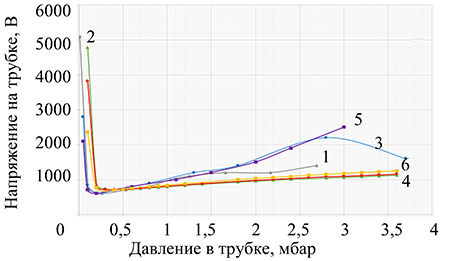 Creation method for series of models with gradually increasing complexity has been used. It is based on a step by step expansion of the range accounted for elementary processes in nonlocal glow discharge plasma in the air. The air is approximated by the mixture of nitrogen and oxygen at low pressures under conditions suitable for experimental verification. 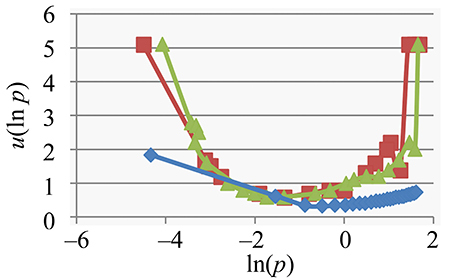 For each iteration of plasma chemical scheme, corresponding numerical models of gas-discharge were created. 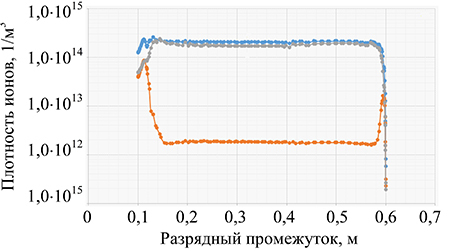 The graphs of the discharge gap electrical parameters on the pressure were obtained by this method. 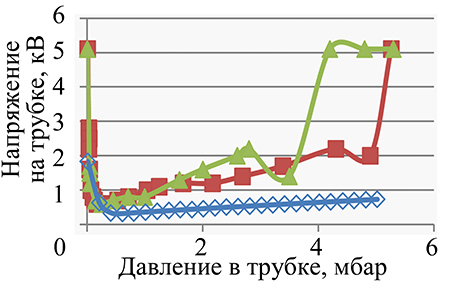 Theoretical data obtained at each step have been compared to the experimental data and the results of previous computer models. Main Results. 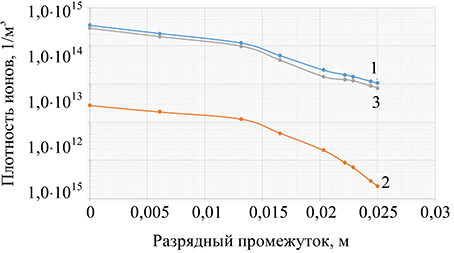 The model has been created that provides a good agreement with the experimentally obtained dependencies of the voltage drop across the discharge gap on the gas pressure in the areas of normal and abnormal glow discharge. 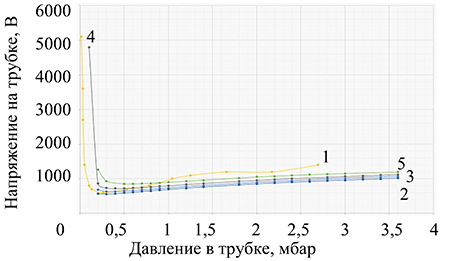 By the updated model the optimum value for the coefficient of secondary electron emission from the cathode was chosen. 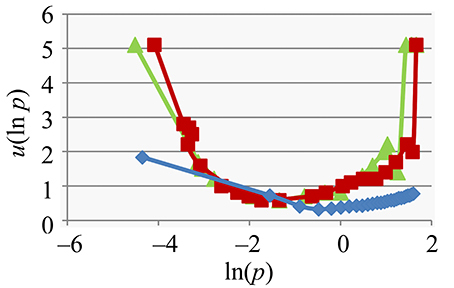 Additionally, we have obtained the spatial distribution of the internal parameters of nonlocal plasma (longitudinal and transverse profiles of the electric potential, electron and ion densities, the electron temperature) as a subject to further experimental verification. Practical Relevance. The created models are perspective to be used for diagnosis and the setting of parameters of micro-discharges in the air. They have different applications, including developing method of electronic collision spectroscopy (CES) gas mixtures. 1. Kudryavtsev A.A., Smirnov A.S., Tsendin L.D. 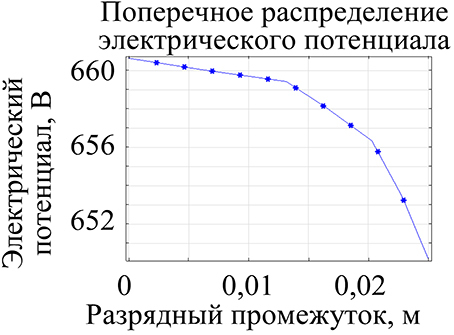 Fizika Tleyushchego Razryada [Physics of Glow Discharge]. St. Petersburg, Lan' Publ., 2010, 512 p.
3. Raizer Yu.P. Fizika Gazovogo Razryada [Gas Discharge Physics]. Moscow, Nauka Publ., Fizmatlit Publ., 1987, 592 p.
6. Eliseev S.I., Demidov V.I., Chirtsov A.S., Kudryavtsev A.A., Kolobov V.I., Bogdanov E.A. 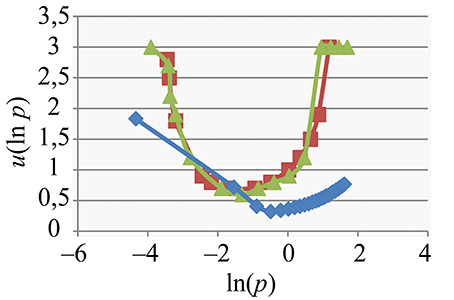 Simulation of pulsed breakdown in helium by adaptive methods. Scientific and Technical Journal of Information Technologies, Mechanics and Optics, 2014, no. 5, pp. 139–146. 9. Comsol introduction. Humusoft. Available at: www.humusoft.com/comsol (accessed 30.08.2016). 10. Ashihara O. The electron energy loss rates by polar molecules. Tokyo, Institute of Space and Aeronautical Science, 1975, vol. 40, no. 530, pp. 257. 11. Dalidchik F.I., Sayasov Yu.S. Recombination of electrons in molecular gases. Journal of Experimental and Theoretic Physics, 1965, vol. 49, pp. 302–305. 13. Biagi Database. Plasma Data Exchange Project. Available at: www.lxcat.net/Biagi (accessed 22.04.2016). 14. Morgan (Kinema Research & Software) Database. Available at: www.lxcat.net/Morgan (accessed 22.04.2016). 15. Phelps Database IST-Lisbon Database. Available at: www.lxcat.net/Phelps (accessed 22.04.2016). 16. Vainshtein L.A., Sobel'man I.I., Yukov E.A. 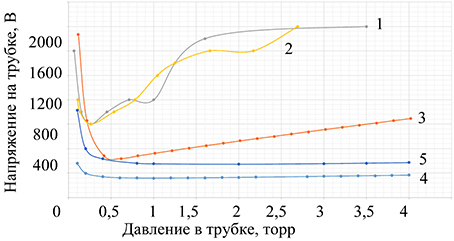 Secheniya Vozbuzhdeniya Atomov i Ionov Elektronami [Excitation Cross Sections of Atoms and Ions by Electrons]. Moscow, Nauka Publ., 1973, 142 p.
17. Fok V.A. Nachala Kvantovoi Mekhaniki [Principles of Quantum Mechanics]. Moscow, Nauka Publ., 1976, 376 p.
18. Sobel'man I.I. Vvedenie v Teoriyu Atomnykh Spektrov [Introduction to the Theory of Atomic Spectra]. Moscow, Fizmatgiz Publ., 1963, 640 p.
19. Sychov S., Chirtsov A. Genetic algorithm as a means for solving a radial Schrödinger equations system. Proc. XIX Int. Conf. on Soft Calculations and Measurements. 20. 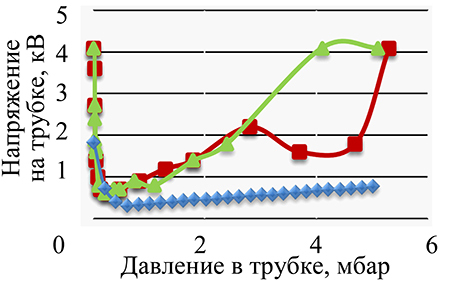 Tuhvatulin A.I., Sysolyatina E.V., Scheblyakov D.V. et. al. Non-thermal plasma causes P53-depended apoptosis in human colon carcinoma cells. Acta Naturae, 2012, vol. 4, no. 3, pp. 82–87. 22. Kalinin L.G., Panchenko G.I., Boshkova I.L., Kolomiichuk S.G. 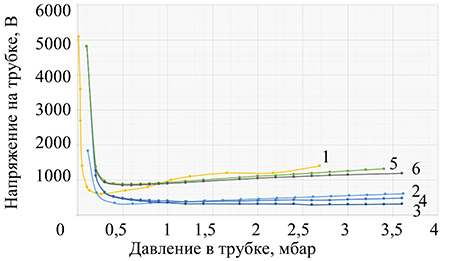 Influence of low-frequency and microwave electromagnetic fields on seeds. Biophysics, 2005, vol. 50, no. 2, pp. 334–337. 29. 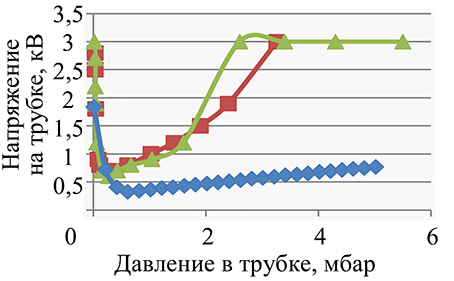 Astafiev A.M., Gutsev S.A., Kudryavtsev A.A. Study of the discharge with an electrolytic electrode (Gatchina’s discharge). Vestnik St. Petersburg State University. Ser. 4. Phys. Chem, 2013, no. 4, pp. 139–142. 30. Barzilovich K.A., Bogdanov E.A., Kudryavtsev A.A.